Shevlin Sebastian from The New Indian Express, Kochi, wrote this piece on Jennifer Kumar in October 2011. This is reprinted with the author's permission. Photo credits: Krishna Kumar. Jennifer Kumar, who is married to a Malayali, is slowly adjusting to life in Kochi. 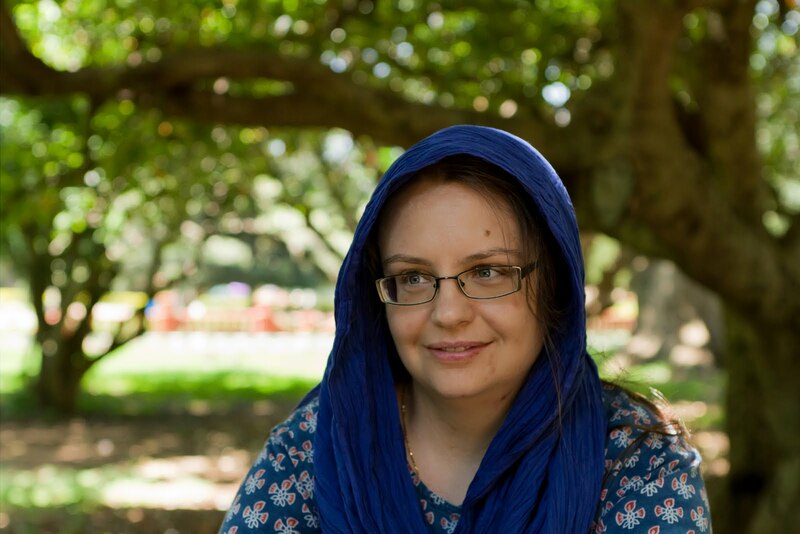 Her interest in India was sparked off and she began learning about the history and culture of the country. In 1999, she embarked on a two-year master’s programme in social work at Madras Christian College in Chennai. She returned and continued with her reading about India. In June, 2003, at the temple, she met Krishna Kumar, a Malayali, who was working in the IT industry. They fell in love and got married in 2005. After several years in the USA, the couple have re-located to Kochi, in February, this year, where her husband works a manager in an American firm at Info Park, Kakkanad, while her in-laws, the Karthas, live in Mattancherry. Meanwhile, she is busy learning how to cook new Malayali dishes. She already knows how to make sambhar, puttu kadala, dosa, idli, chutneys, and upuma. Since her husband grew up in Delhi, she makes North Indian dishes like masala puri, dal, roti, and Rajma. 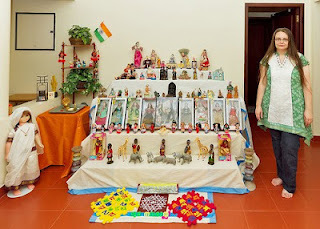 Jennifer has so embraced the Indian culture that she has made a Navarathri golu (an exhibition of dolls placed on wooden tiers) at her Kakkanad home. On the floor, she has written 'Shub Navaratri' in Malayalam. Behind it, are small statues of the Dasavatar, the ten incarnations of Vishnu, as well as a book by motivational author Robin Sharma called, 'The leader who had no title'. On the first tier, the theme is Africa. So, there are clay figures of the zebra, hippopotamus, crocodile, and an elephant. A couple of tribal men are looking with fixed eyes into the distance, holding spears in their hands. On the second step, there are Barbie dolls from various countries like China, Ireland, Portugal, Holland, and Mexico. Right at the centre there is a doll of Bollywood superstar Hrithik Roshan. On other steps, there are statues of Lord Buddha, Shiva, Krishna, Ganesh, and a blue-beaded Hanuman. There is Jesus Christ in a manger, surrounded by his parents, Joseph and Mary, as well as the shepherds, apart from a statue of Santa Claus from Hungary. Jennifer’s family is originally from Hungary. Two dolls from Hungary, a boy and a girl, have only one eye. “As a couple you should see the world through one pair of eyes,” she says. And so, Jennifer, who knows how to wear a saree and a salwar kameez, is slowly getting adjusted to life in God's Own Country. Thank you for writing such nice words about me, and allowing me to republish this here, Mr. Shevlin. See the original article by clicking here.